The scarlet berries should be picked from the beginning of October onwards. If you pick them too early, you risk the seeds being immature. Collect the bunches directly from the tree by gripping the branch below the bunch and pulling. In this way, no damage is caused to the parts of the tree that will continue to grow. A large number of berries can be collected in a short time. 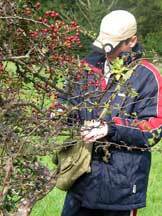 Hawthorn is perhaps one of the easiest of the berry fruits to extract seed from. You need a bucket or two, a flat-bottomed pole (for example, an old sawn-off spade handle), a sieve or collander and access to a hosepipe or water supply. The berries are mashed and the waste and seed separated through the sieve. For a more complete description click here. The pot needs to remain outside for eighteen months. This is where patience is required! 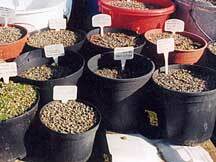 Water the pots if they show signs of drying out and protect from birds and mice if they discover your seeds. We will be sowing the seeds the second spring following collection – hawthorn seed is deeply dormant and needs this long before it will grow. 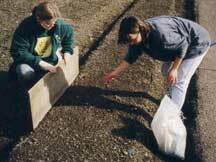 In early February of the second year after collection (for example, February 2009 if you collect your seeds in October 2007) check for signs of germination. 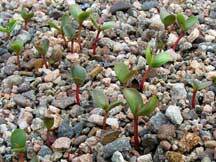 If about 10% are showing signs of germination, they are ready to sow. Hawthorn are not particularly demanding to grow, but ensure that they are kept moist at all times. The only problem you may find when growing hawthorn is mildew. Good hygiene can reduce the risk – don’t touch your plants when they are wet and don’t water the foliage too late in the day. Both these measures can help prevent infection. If mildew does appear, treat quickly with a fungicide, preferably organic. 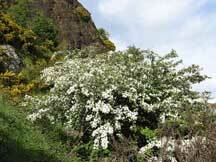 This aside, hawthorn can grow quickly and should be ready after either the first or second year for planting out. Prepare the site well by clearing away any weeds or grass and make a hole big enough to accommodate the root ball. Plant carefully in the hole, to the same depth as it was in the pot, and firm back the soil. Alternatively, when planting a hedgerow, dig a trench to incorporate 8 plants per metre.